Ducati ups the game in the middleweight sportsbike segment with its larger, more powerful 959 Panigale. A day with it at an international race track was a great way to experience its prowess! Sportsbikes have to be the purest form of the motorcycle. They were built with one single purpose, that of lapping a racetrack as quickly as possible. To someone addicted to speed and motorcycles, there has to be no joy greater than enjoying a thoroughbred supersport machine at a race track, perfecting corner after corner, lap after lap. The itch to do so is perennial, but unfortunately there’s not many opportunities I get, unlike motoring journalists abroad. So when Ducati invited us to Thailand to experience its all-new 959 Panigale, I barely bothered checking if I was free on the dates before packing in my race suit! To give you a quick brief, the 959 Panigale is the 899 Panigale’s successor, which had replaced the 848 EVO. The point is, Ducati has been hiking displacement for what is essentially supposed to be a middleweight supersport. When you mention ‘middleweight’, what come to mind usually are 600cc motorcycles. Let’s admit it – the game has moved forward though, and bigger is definitely better in today’s world. Which is why manufacturers have blurred the lines between the 600cc and erstwhile 750cc sportsbike categories. And that’s also why modern day ‘middleweight’ sportsbikes are displacing in the region of 800cc. Ducati of course has always believed in ‘no replacement for displacement’ which is why the 959 Panigale. Displacing 955cc, it is just 45cc short of the average litre-class superbike, but is supposed to be a ‘super-mid’ sportsbike! And with 159PS on offer, its output is in the same region as what most litre-class bikes made until a few years ago. Is it still a ‘middleweight’ then? I couldn’t have asked for a better location than the new Chang International Circuit in Thailand to find out. The circuit was spruced up last year to bring it up to the mark and hosted its first ever WSBK round in 2015. A world-class racetrack and the latest generation sportsbike from the Ducati. Sounds like a lot fun, no? And what a day it was, especially since Ducati had turned our press ride into an advanced level DRE (Ducati Riding Experience) course for us. We were thus going to experience the motorcycle on track and learn from some of the best coaches in the world! I’ll save the DRE bit for another story; for now let’s focus on the bike. The higher displacement was met by increasing the stroke of the 899 Panigale’s 90 degree L-Twin motor, while the bore remains unchanged. To make the engine Euro 4 compliant various engine components like the head case and covers, timing chain, gears and guides were revised. The idea while creating the new motorcycle was to make it friendlier and easier to ride, more aerodynamic and, of course, more powerful. Performance gains were made possible thanks to the addition of a high flow air filter, larger diameter exhaust and ‘showerhead’ style fuel injectors, and a slipper clutch. Other critical changes include redesigned, machined aluminium footpegs for better grip and a swingarm pivot that’s 4mm lower than the 899’s to offer better grip at the rear under hard acceleration. Thanks to the changes the 959 Panigale also boasts a better power to weight ratio, tipping the scales at a mere 176kg dry. That’s the kerb weight of several quarter-litre machines! The end result of all the hard work is a bike that looks a lot more like the larger 1299 Panigale. And that’s because the body panels are now identical. The fairing is wider than the 899’s and is in fact the same as the 1299’s. Ditto for the headlights and mirrors. The wider stance makes for better aerodynamics as well, especially on track. Of course, the electronics suite is a lot more advanced too, including enough gadgetry to make the 959 idiot-proof. Quite literally. The package is standard, and includes a Bosch ABS 9MP Brembo braking system with three levels. 1 is the lowest and is essentially race ABS, with no rear-lift prevention, while 2 and 3 are progressively softer with rear lift control. Then there’s the latest generation DTC (Ducati Traction Control), based on the stuff Ducati uses in MotoGP and WSBK. Level 1 provides minimum intrusion, letting those who dare to slide the rear and enter corners fully sideways. I for the record did not try that, and was happier sticking to levels 2 and 3. The 959 also gets the now de rigueur quick shifter that lets you upshift without using the clutch or closing the throttle. And it is a boon on a machine as quick and as powerful as this one. It worked beautifully, offering precise shifts, but only at high revs. The good news is, you can switch it off too. There’s Engine Brake Control too, which optimises stability when entering corners, and gets three levels. And that’s apart from three riding modes, including Race, Sport and Wet. Race is the full blast mode with minimum intrusion from the electronics. It is the mode that makes you feel like a MotoGP star, letting you enter a corner sideways and exit it with a massive wheelie, plastering a huge smile on your mug. We did stick to Race mode through most of the day, but without the theatrics. That’s something that was enjoyed best by Alessandro Valia, our instructor for the day, and the man who’s developed almost every road going Ducati over the past decade. As Ducati’s chief test rider he’s the guy who’s developed the 959 Panigale and was able to make the most of the bike’s immense potential. In fact, I’d go to the extent of saying the man was riding the 959 as if it were a toy! The first session was taken rather slowly in Sport mode to understand the track and the bike both. It was easy to get accustomed to the bike’s committed yet rather comfortable ergonomics. The riding position is not as extreme as some of the other supersport machines, including the Triumph Daytona 675R sold in India. The 959 feels more relaxed, with the clip-ons slightly higher and the perch both wider and less steep. Exiting pitlane at the stipulated 60kmph the bike seemed to be straining at its leash, and an open throttle on the straight after the first corner is where I was able to give it a free rein. Being a V-twin, the 959 was quick to offer the wealth of its midrange punch, accelerating with an aggression that didn’t exactly stun me but was pleasing to say the least. Unlike an inline four or a triple I didn’t have to wait to hit the motor’s sweet spot, and I found myself taking a liking to the engine’s character instantly. The Chang International Circuit is a fast one, and its corners are smooth, flowing curves. Most can be taken in third or even fourth gear, which means I could enter corners at close to 100kmph, or even more. The sense of fluidity to the corners is something the 959 Panigale took a liking to quickly. The fully adjustable Showa forks upfront and powerful Brembo brakes with their sharp bite made ease of going fast around corners, while the electronics offered a lot of confidence. For the next session we switched to Race mode, and the acceleration felt a lot fiercer, yet not as scary as a litre-class machine. Despite the way the 959 was building up speeds I never felt out of control, and what was even more reassuring was the bike’s stability when braking from as high as 250kmph for the fast right hander that turn 3 was. The straight after that leading into turn 4 was dispatched at more than 200kmph on every lap, and was taken flat-out in fourth gear at close to 150kmph. The confidence from the Pirelli Diablo Rosso Corsa tyres was exceptionally good, and together the grip from the tyres, the beautifully set up suspension, the chassis (that uses the engine as a stressed member) and the strong engine performance made for a sublime feel. The ease with which I was able to ride the 959 Panigale fast around the track almost made me forget that my last ‘proper’ track day was over a year ago. I’d also credit that to the motorcycle’s forgiving nature that made it easy to make a mistake around a corner yet not mess it up. There were times when I entered a corner too hot, especially turn 3 where we were consistently braking from 240-250kmph lap after lap. The ease with which the Brembos helped shed speeds and even trail the brakes into the corner was wonderful. The efforts gone into offering a motorcycle that’s rewarding to an experienced rider yet equally forgiving for newbies were clearly visible, corner after corner. And the safety net offered by the electronics package only made the 959 Panigale all the more enjoyable. The brief while developing the motorcycle, as Valia informed us, was to make a road going machine that’s sharp enough to be enjoyed on track. And what an awesome combination of the two it is. The 959 Panigale is a great example of Ducati’s prowess in making machines that connect to a rider’s soul with their emotiveness. The connected feel from the bike, especially in Race mode, was something all of us enjoyed immensely. What’s even more enticing about it is the 959 Panigale’s price tag. At Rs 13.97 lakh ex-showroom New Delhi it is a cracker of a deal, when you consider the highly advanced electronics, brilliant handling and strong performance. In fact, at just about 2 lakh rupees more than the Triumph Daytona 675 R, the Ducati 959 Panigale is a motorcycle that’s a lot more powerful, enjoyable and safer as well. Having finished off one set of knee sliders over the course of the day at the track, what I’m now keen on finding out is how the motorcycle feels on the road. Especially since motorcycles that are extremely good on track yet equally satiating on the road are hard to come by. 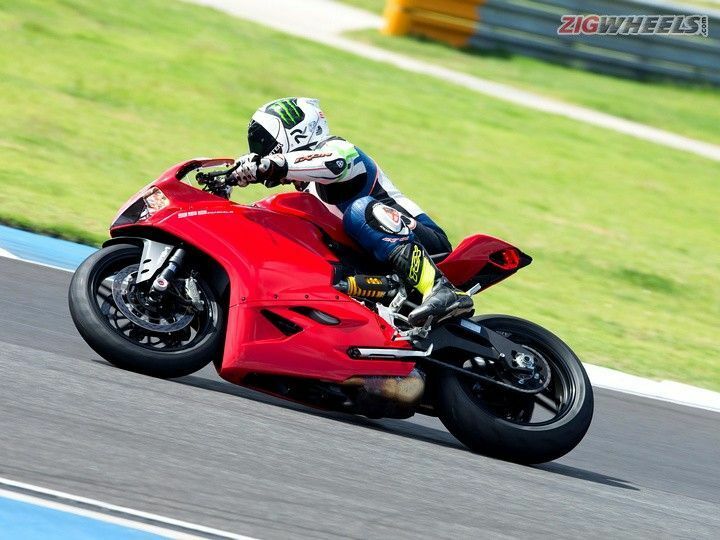 May be the Ducati 959 Panigale will make an exception for itself. May be. Share your experiences with 959 Panigale?